There's a mystery afoot about the newly discovered Sherlock Holmes story. In a truly fitting turn of events, many people are expressing suspicions over the "lost" Sir Arthur Conan Doyle story, found in a charity pamphlet created to save a beloved bridge in Scotland. True fans of Conan Doyle say he probably isn't the story's author. Sounds like a case for Sherlock himself. Walter Elliot, an 80-year old historian, believes he has found a forgotten Conan Doyle story in a collection of short stories written to save a bridge in Selkirk Scotland. The Book o' The Brig, as it was called, collated short stories from locals and was sold to raise money. 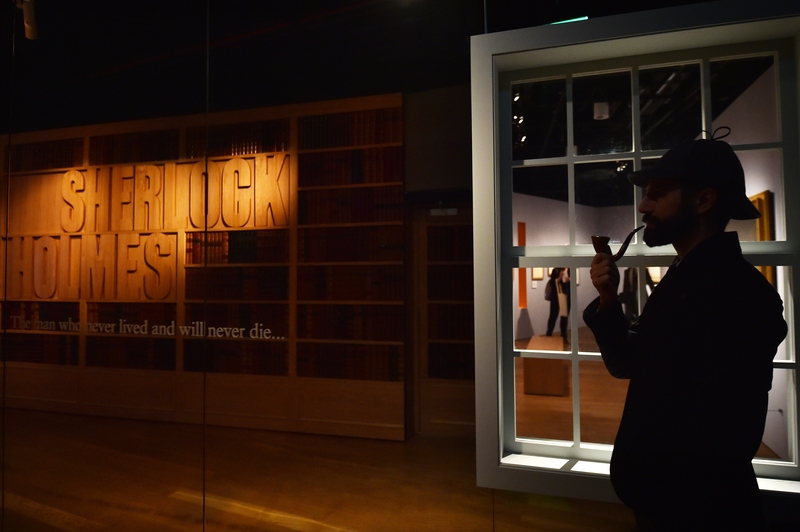 When Elliot went into his attic to find the book, offering it to a pop-up museum in Selkirk, he discovered a Sherlock Holmes story in his edition, called "Sherlock Holmes — DISCOVERING THE BORDER BURGHS, and, BY DEDUCTION, the BRIG BAZAAR." However, it's a reputable source that claims that there's no way Conan Doyle is the real author of this "discovered" Sherlock Holmes story. Mattias Boström, a member of The Baker Street Irregulars and author of the nonfiction book From Holmes to Sherlock, lays out his investigation into the mystery. For starters, it doesn't say on the story that it was written by Conan Doyle. But moreover, nowhere in the entire The Book o' the Brig does it say Conan Doyle was a contributor — and there is a list of contributors. Seems weird to not list a hyper-famous writer in a book that is trying to make money. Either it's not really his story, or the creators of The Book o' the Brig could have used some lessons in Marketing 101. The Committee of the New Bridge Bazaar have pleasure in announcing a Second Edition of this most popular Book ... To Souters at home and abroad it will form a most interesting Memento of the Town and the Movement, as its Contributors are either Natives, or Borderers who have a close interest in the Town. Notably, Conan Doyle is neither a Native nor a Borderer. Secondly, this is how the story is described in the pamphlet. The book lists three interviews, as follows: Walter Scott, Mungo Park, and Sherlock Holmes. The story is pastiche, and the story itself pretty much admits to it, if you actually read it all through. The narrator of the story talks about how he plans to write a story about Sherlock Holmes and Dr. Watson. It's a celebration of Conan Doyle's work and characters, but not actually his work, says Boström. And Electric Literature adds two more pieces of evidence to the mystery. First of all, there's the issue with the title. What Sherlock Holmes fans have ever read a title so verbose? And second, Dr. Watson narrates nearly all Sherlock Holmes stories, save for three. Those three? Two were narrated by Holmes and one in the third-person. This invisible "writer" or "narrator" of the discovered story just flat-out isn't Conan Doyle's style. This isn't to say that the historian who uncovered this story is a liar, it's just that it shows first how much everyone loved Holmes and Watson at the time and second how much we still love him and wish there were more stories to read today.